The Georgia Department of Juvenile Justice is a multi-faceted agency that serves the state's youthful offenders up to the age of 21. The Department of Juvenile Justice (DJJ) Office of Communications (OoC) is the point of contact for media inquiries from all local, state and national news organizations. The OoC is solely authorized by the Commissioner as the Department’s official media liaison to provide timely and accurate information about DJJ and its 26 juvenile secure facilities and 96 community services offices (CSOs). The Office of the Ombudsman acts as a single point of contact for family members, advocates, and other concerned citizens who are interested in reporting complaints on behalf of youth under supervision to the Georgia Department of Juvenile Justice. DJJ is pleased to announce the deployment of a Community Resources Database for use by staff, youth and their families. The database consists of more than 1,200 resources statewide. DJJ will continue to add to the database as new resources become available. 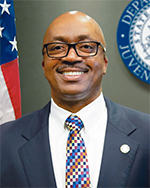 Notice is hereby given to the public that the monthly meeting of the Department of Juvenile Justice Board and the Department of Juvenile Justice Board of Education will be held at 10:00 a.m. on Thursday, April 25, 2019 in the Board Room at 3408 Covington Highway, Decatur, Georgia 30032. Pursuant to O.C.G.A. § 50-14-1(e)(1), the agenda for said meetings are attached. If you require assistance, please call 404-508-7243. Watch the WJBF Augusta news story "DJJ Commissioner wants to move kids from the 'back seat' to the 'front seat' in life" here. DJJ is proud to announce that the Eastman Youth Development Campus (Eastman YDC) has been selected as the recipient of the 2018-2019 Georgia School Nutrition Foundation (GSNF) School Garden Grant. Recently, youth at Gainesville Regional Youth Detention Center (Gainesville RYDC) received the empowerment of learning the basic skills of banking and finance from a local expert. Aquaponic Gardening is coming to the Elbert Shaw RYDC. Recently, the Aaron Cohn Regional Youth Detention Center (Aaron Cohn RYDC) and Muscogee Youth Development Center (Muscogee YDC) both underwent week-long American Correctional Association (ACA) audits for national accreditation of their facilities and operations. The Home Depot and the Office of Reentry Services are both helping to provide youths in DJJ care with the professional and personal skills needed to succeed in the 21st century. Whether computer skills, mechanical skills useful in a warehouse or “soft” skills for the workplace, DJJ youth are receiving training for future employment and life in general. The Criminal Justice Coordinating Council is pleased to release FY2020 Juvenile Justice Incentive Grant Program solicitation. The Juvenile Justice Incentive Grant Program is designed to reduce both juvenile felony commitments to the Georgia Department of Juvenile Justice and short-term program sentences through the use of evidence-based programs shown to reduce recidivism among juveniles and to promote a positive relationship among the youth, their family, and their community. Applicants are limited to local county commissions/boards of commissioners to apply on behalf of juvenile courts within Georgia. The solicitation can be found at the title link or CJCC’s Funding Opportunities web page. All applications are due at 5:00PM on April 26, 2019.